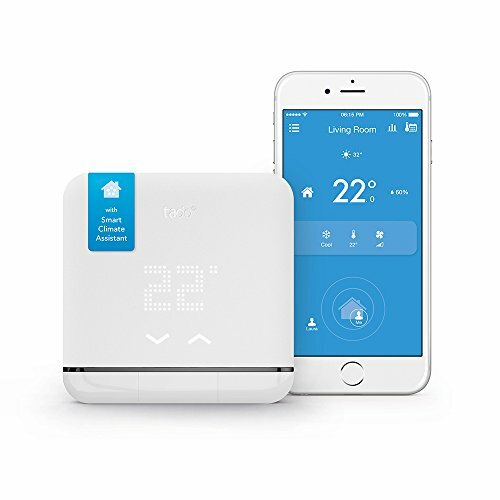 tado° Smart AC Control V2 - Smart Climate Assistant for Your Air Conditioner, Wi-Fi, Compatible with Alexa, Google Assistant & IFTTT"
- "tado° Smart AC Control V2 - Smart Climate Assistant for your Air Conditioner, Wi-Fi, Works with Amazon Alexa, Google Assistant & IFTTT"
- Connects your smartphone to your air conditioner or heat pump and turns it into a smart device to maximize your comfort. Use the tado° app to control your AC from anywhere, at any time. - NEW: Smart Climate Assistant features: Geofencing for location-based control, Weather Adaptation, Smart Schedule, Climate Report & Multi-room support. - Saves up to 40% on your AC energy costs. The Energy Savings Report in the app estimates how much you save + 100 days Energy Savings Guarantee from tado°. - Smart Home Integration: Voice Control with Amazon Alexa und Google Assistant or bring products and web services together to create new scenarios with IFTTT.